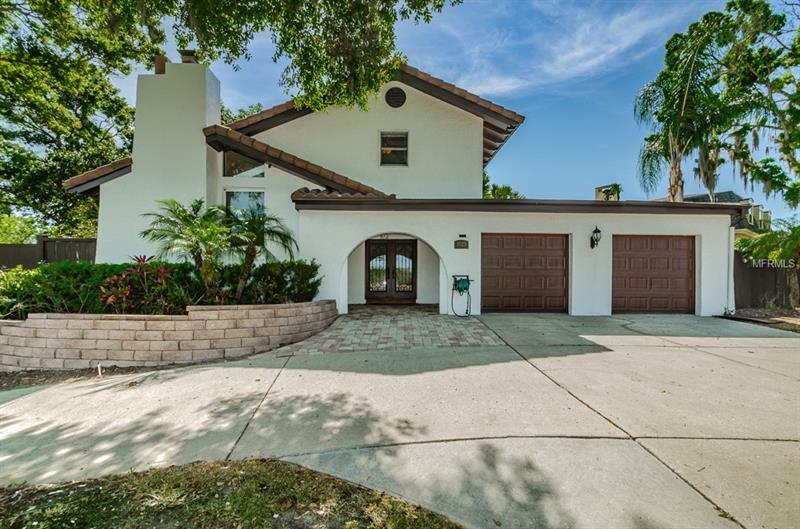 Gorgeous Mediterranean style home in prestigious Westlake Village. Elevated & fenced in corner lot provides extreme privacy for the amazing backyard pool area. Circular driveway & grand foyer entrance with glass & iron wood double doors. Separate family room with double doors facing the pool. The European flair of the kitchen combines wood cabinets, wood countertops & brick features. Wood floors throughout main living area & ceramic tile in kitchen & bathrooms. Romantic arched balconies on the second floor & skylights provide for a bright & open living area. Sliding doors off the dining room lead to a huge outdoor deck area perfect for morning coffee or evening gatherings. Remodeled bathroom with elegant fixtures, granite countertop & recessed lighting. Oversized 2 car garage with brand new hurricane graded doors. The outdoor area is extremely inviting with lots of room to create your own garden or playground for the kids. Professionally painted both interior & exterior. Opportunity to expand an additional 23’ x 27‘ of living area above the garage. This wonderful community offers tennis courts, playground, community pool, basketball courts, clubhouse & beautiful parks. You can’t beat the school district & the proximity to Florida's best beaches including Honeymoon Island, Pinellas Trails, & a variety of restaurants near by. Tile roof with over 25 years of life left & 2x Newer A/C units. Top of the line front loading Washer & Dryer and refrigerator in the garage also stay!